earliest normal activities‹I mean in children's play. - Beyond the Pleasure Principle . 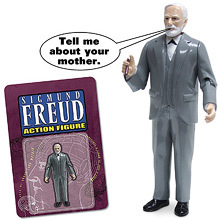 i know this because yesterday, in a gift shop, one sighted a child's doll that was actually a Sigmund Freud ACTION FIGURE. there is not much left.